Habit: Annual, glabrous or puberulent. Stem: prostrate to decumbent, generally several from base, (0.3)0.6--2.5(3.5) dm, branched distally. Leaf: basal rosetted, (3)4--10(15) cm, 1--2-pinnately divided, lobes entire or dentate; mid-cauline petioled, pinnately divided, base cuneate, lobes entire or dentate. Inflorescence: leaf-opposed, not elongated, rachis glabrous. Flower: sepals 1--1.5 mm, persistent; petals, white, obovate, 1--2 mm, 0.4--0.6 mm wide; stamens 6. Fruit: indehiscent, reniform to ovate-cordate, flattened, 2.3--3.4 mm, 3--4.4 mm wide, wingless, notch 0; valve walls thick, distinctly ridged, glabrous, prominently veined; style 0.2--0.7 mm; pedicel (0.7)1--2(2.4) mm, stout, cylindric, ascending, glabrous. Seed: 1.2--1.6 mm, oblong. Chromosomes: 2n=32. Synonyms: Coronopus squamatus (Forssk.) Asch. ; Lepidium squamatum Forssk. 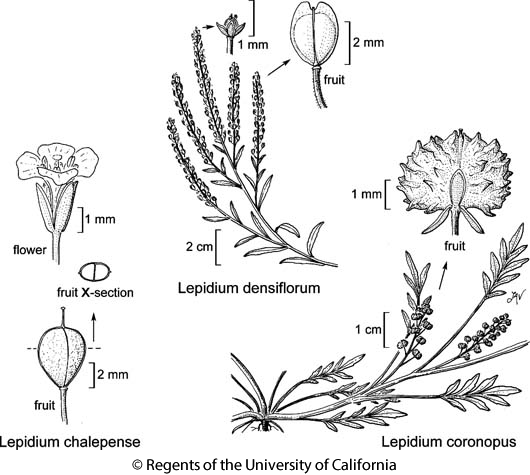 Citation for this treatment: Ihsan A. Al-Shehbaz 2012, Lepidium coronopus, in Jepson Flora Project (eds.) Jepson eFlora, http://ucjeps.berkeley.edu/eflora/eflora_display.php?tid=91770, accessed on April 19, 2019. ScV, SnFrB, DSon; Markers link to CCH specimen records. Yellow markers indicate records that may provide evidence for eFlora range revision or may have georeferencing or identification issues. Purple markers indicate specimens collected from a garden, greenhouse, or other non-wild location.